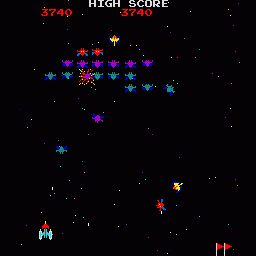 The sequel to Space Invaders, and the prequel to Galaga, 46 alien ships line up in formation (30 blue, 8 purple, 6 red and 2 command ships) and move back and forth across the screen at a fixed height. 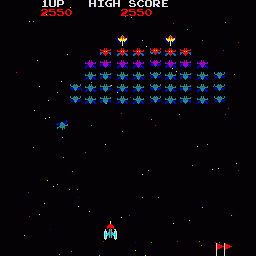 They do not move down the screen as in Space Invaders, but instead in Galaxian the alien ships break formation and fly down the screen to attack your ship. 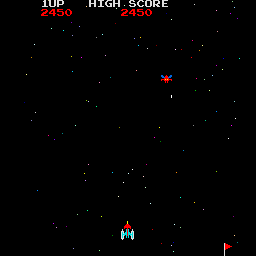 Your ship is stationed at the bottom of the screen, and can move left and right, and fire one shot at a time. You cannot fire again until the shot either hits an alien ship or moves off the top of the screen. The alien ships leave their convoy and attack either singly or in formation. They swoop down the screen towards you and rain shots down at you. The bullets mnust be avoided and you can shoot the alien ships when they are charging, and you score more points than when they are in formation. Occasionally the command ships will come down the screen flanked by two other alien ships and you score the highest points available in the game for picking off the command ships at this time. The stage ends when you clear the screen of alien ships, and you advance to the next stage, with another 46 alien ships to confront. The stage you are playing is denoted by flags at the bottom right of the screen. An extra life is awarded at 7,000 points. Scoring: Blue Alien In Convoy: 30 points. Purple Alien In Convoy: 40 points. Red Alien In Convoy: 50 points. Command Ship In Convoy: 60 points. Blue Alien Charger: 60 points. Purple Alien Charger: 80 points. Red Alien Charger: 100 points. Command Ship Charger: 200-800 points. Try to only destroy the command ships when they are attacking in formation for the highest points. If you move from the centre to the edge of the scren when aliens are charging down at you, the alien ships will most often move off the screen and return to their formation at the top of the screen.